The team helping the archaeologists is optimistic. They spent weeks acquiring specialist knowledge and now they have finally made it to the excavation site in Egypt. How many valuable artifacts will they be able to dig out? Time is short to make discoveries. In only 2-3 years they have to acquire all the knowledge they need to carry out their excavations and find enough artifacts to fill their exhibitions. Thebes is a fun medium to light game about archeological exploration during the early 20th century. The board is beautifully designed and painted by Michael Menzel. Menzel is arguably the best artist in boardgaming. Examples of his work include Stone Age, The Pillars of the Earth, Shogun, World without End, A Castle for All Seasons and many other beautiful boards for board games. Thebes is actually a remake of a 2004 German game Jenseits von Theben. This Queen Games 2007 version mainly remains true to Peter Prinz’s hand made original with few tweaks and great art and component upgrades. The result is a game that has a great balance of strategy, tactics and luck. It really feels like you are an archaeologist digging for treasure (lost artifacts). Around the outside edge of the board is track that is numbered 1 to 52. These represent weeks. In the upper left hand corner are three years 1901, 1902 & 1903. Every action a player can take costs time. The player moves the amount of spaces that the action requires on the track and then takes the action. Usually better actions cost more time. A clever component of game is that only the player the furthest back can take an action. So player are constantly changing order of play and leapfrogging each other on the time track. Occasionally one player may fall far behind as all of the other players take time heavy actions. This player can choose to take several actions back to back as long as he or she is still the last player on the time line. The game ends when all of the players have finished 1903. So what are these actions that cost time. 1. Research can be done in the European cities Berlin, London, Moscow, Paris, Rome or Vienna, by paying for the cards located in those cities with time. 2. Excavation is the best part of Thebes. It can be performed in the ancient areas of Greece, Eqypt, Crete, Palestine or Mesopotamia. The way excavation works by using a special decoder wheel (probably one the best pieces in any game) to calculate the value of the “dig”. The wheel takes into account how much research you have done and how many weeks you plan to dig and gives you a number. This number represents the amount of tokens you can pull from a bag full of tokens for each dig site. Some of the tokens have treasures that equal victory points and others are no more than dirt. After you have pulled your allotted number of tokens, you keep the treasures and return the dirt tokens to the bag. This makes digging for treasure progressively harder as the game goes on. 3. Exhibitions take place in the European cities and require certain types of treasures and time as well. This is another way to earn victory points. 4. Travel costs time and is combined with any other action. Thebes is a game that is wide open with players deciding how they want to pursue getting the treasures for victory points. There is balance on going early with less knowledge (research) and having a better ratio of treasure to dirt or going later and having more token pulls. The game is fairly easy to learn and teach with the steepest learning curve coming on the time track. It scales well for 2 to 4 players. 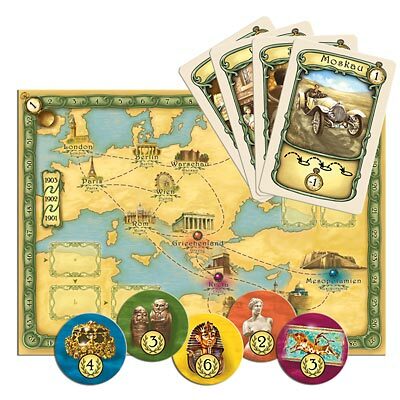 Thebes sets up in 5 minutes and plays in 45 – 90 minutes depending on the number of players. Most of all it is a lot of fun (even though I have terrible luck with my treasure pulls). •	Anyone with a sense of adventure. The theme is apparent and you really feel like you are going on archaeological digs in the early 20th century. •	Fans of medium/light games like 7 Wonders, Ticket to Ride, Tobago, and Alhambra. •	People who like a little luck in their games. •	Children over 10 with some adult help. •	Avid, Family, Casual and Social Gamers. •	New gamers. This should not be a game you should try out on someone who is new to the hobby. This is a game to work up to. •	People who can’t stand any luck in their games. •	Strategy and Power gamers. The components of this game are extremely well made and very in keeping with the theme. Each location has a bag of “Treasures” to discover, each player has a dial to aid them in deciding how much time to spend digging vs potential reward. This game has a great theme and the mechanics work really well to enhance the theme. The game is played over a set time (a number of years + weeks depending on the Number of players) where each action or move costs a number of weeks marked on a track around the board. The further person back always goes first so making sure you optimise your turn is important, initially you move around the world collecting Knowledge, in the form of cards, each move to a city costs a week and each card collected costs a number of weeks depicted on the card. Cards can only be collected by being in the city marked on it. Once you think you have sufficient knowledge you can go to one of the Dig sites. Once there you look at your accumulated knowledge and using your dial determine how many weeks to spend digging this will then determine how many tokens you can grab out of the appropriate bag. In each of these bags are a number of different valued Artifacts as well as a number of blank cards, after you draw you keep the Artifacts which are now your VP’s and replace the blanks into the bag. During the game you can also use your collected Artifacts to put on exhibitions, in order to do these you will need a certain number of artifacts from each dig site and be in the appropriate city. These can then be collected and add VP’s, but as new ones appear old one’s are removed and later exhibitions require a lot of artifacts to put on. This game is extremely fun to play and whilst it does involve an element of luck there are strategies and tactics needed to win the game. Overall I would thoroughly recommend this game to anyone as it appeals to all levels of gamers. The 4 player game as laid out in the rules plays differently to other numbers of players. This is because the game is played over 2 years in a 4 player rather than the normal 3 years. Having less time significantly changes tactics and strategies. We’ve found that for a 4 player game if you set it up the same as a 3 player game it works much better. Add a Review for "Thebes"